The local author signs copies of his new work, 60 Hikes Within 60 Miles: Albuquerque: Including Santa Fe, Mount Taylor, and San Lorenzo Canyon - 3rd Edition. 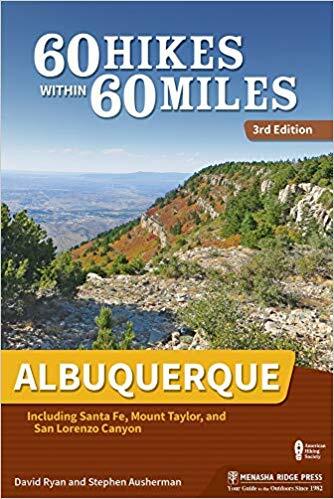 Local author David Ryan, a former businessman turned long-distance walker, will be at Page One Books 3:00 pm Sunday, March 24, to talk about and sign the newly updated guide, "60 Hikes Within 60 Miles: Albuquerque: Including Santa Fe, Mount Taylor, and San Lorenzo Canyon - 3rd Edition." The book is described as such: "Get outdoors with local authors and hiking experts David Ryan and Stephen Ausherman with the new full-color edition of '60 Hikes Within 60 Miles: Albuquerque.' These trails transport you to scenic overlooks, wildlife hot spots, and historical settings that renew your spirit and recharge your body. Each hike description features key information on length, hiking time, difficulty, configuration, scenery, traffic, trail surface, and accessibility, as well as information on the history and natural history of the area. Detailed trail maps and elevation profiles, along with clear directions to the trailheads and trailhead GPS data, help to ensure that you always know where you are and where you’re going. Tips on nearby activities further enhance your enjoyment of every outing. Whether you’re a local looking for new places to explore or a visitor to the area, '60 Hikes Within 60 Miles: Albuquerque' provides plenty of options for a couple hours or a full day of adventure, all within about an hour from Albuquerque and the surrounding communities." Ryan left his conventional job in the business world at the age of 49 to rearrange his life into a mixture of income-producing and personal activities. Since making that change, he has found time to walk the 2,180-mile Appalachian Trail from end to end, walk the Camino de Santiago from France to Santiago de Compostela in the west of Spain, become involved in archaeology, earn a black belt in aikido, and pursue several other outdoor and walking activities. For the past 18 years he has explored the New Mexico backcountry, looking for previously unknown archaeology sites as a volunteer for the Bureau of Land Management. He is the author of "Long Distance Hiking on the Appalachian Trail for the Older Adventurer," "The Gentle Art of Wandering," "The Bisbee Stairs," and a blog on walking and wandering at www.gentleartofwandering.com. Ryan lives in Albuquerque with his wife, Claudia, and his three dogs: Paddy, Petey, and Sparky. Page One Books is located at 5850 Eubank Blvd NE, Suite B-41, in Albuquerque's Mountain Run Shopping Center (southeast corner of Eubank and Juan Tabo). The Ryan event is free and open to the public. For more information, please call 294-2026 or visit www.page1book.com.